Tiny House Of Recycled Construction From A Modern Prefab House Owner! Greetings from the shiny modern prefab house kit! 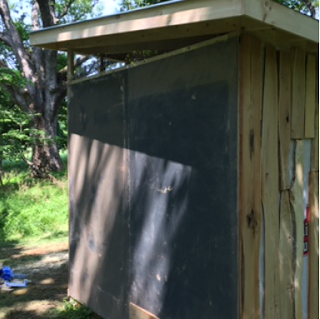 This week, we start with an update from a modern prefab cabin owner! A Dogtrot Mod owner (the modern cabin from our Green Cabin Kits line of modern prefab houses) sent in some cute photos of a tiny house studio she built for her cats with recycled leftover materials from construction projects on her property! 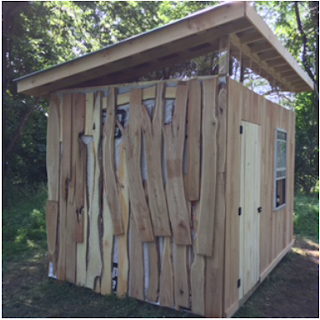 The 8 x 12' dimensions of this tiny house for cats was determined from the leftover hardiplank pieces and scrap lumber. 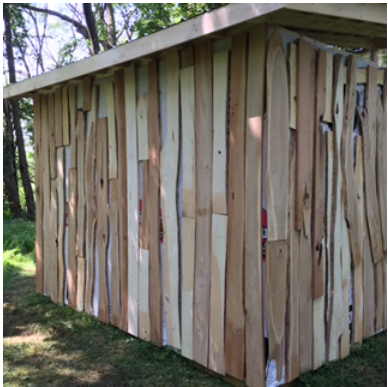 With the variety of scrap wood, boards were added haphazardly along the wall, overlaying the graffiti-like house wrap, to create a cascading, fun, modern patchwork look. Using plexi, the clerestory windows provide daylighting without reducing much the energy efficiency of the structure. The window was acquired years ago, free from a builders' supply, and previously used in a cold frame by the owner. White hackberry door with locust. it is sleek, modern, while warm. "...It's OK to note the one wall looks like a Duchamp painting in the Philadelphia Museum of Art. And - do let your readers know that hackberry is NOT a wood to be used outdoors: it rots!!! ... I had researched hackberry in various states' forestry department or extension sites before deciding to use it, but had managed to miss sites that clearly warn against its outdoor use. Our local Penn State Ext. office contacted a wood expert for me re: possible remedies, and he said that I could use Clorox and seal it every year, but that in 5 years it would have to be replaced." OK Y'ALL SO DON'T USE HACKBERRY OUTDOORS, 'K? Now you know. Assorted lumber covering the facade in a fun, warm look. 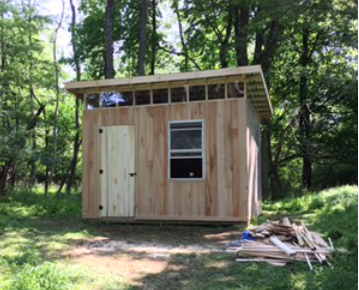 I am SO appreciative when prefab house owners send me pictures of their projects! THANK YOU to this wonderful client for keeping us abreast of her delightful property story as it evloves. The Duchamp reference piqued my interest and was a great excuse to head over to the online collection of the Philadelphia Museum of Art. I really enjoyed looking at their archives! 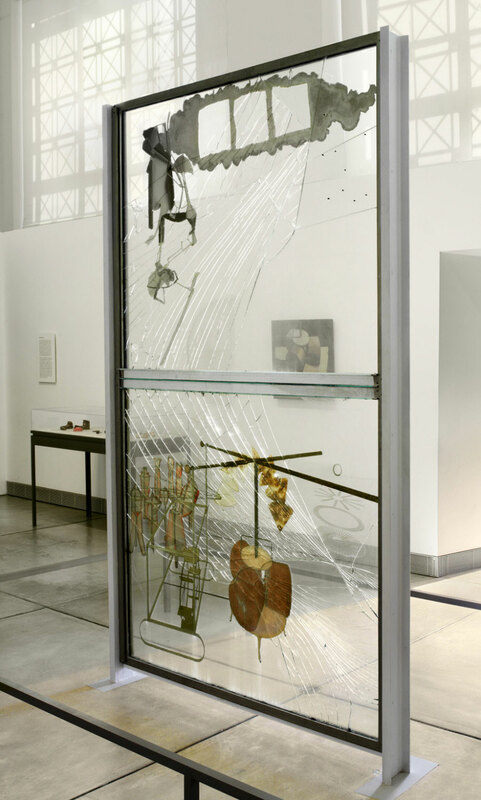 Here is a Duchamp piece I thought especially cool, "The Bride Stripped Bare By Her Bachelors, Even." ...and joking, once the top was on, that, "Oh look we're done!" Ok here it is really done. at least he's using math and programming to do so... siiiiiigh. Then it was on to Patrick Henry's Red Hill for hot cider, brunswick stew, and history! We returned from the drizzly cold excursion to a cozy evening of gluhwein on the cook stove and movies. Speaking of Patrick Henry, Pip 2 accompanied me for jury duty to the Thomas Jefferson-designed courthouse earlier this week, which is also where Patrick Henry debated states' rights with John Randolph. It was pretty cool and educational for her to see! This winter has been mild, but it still is down in the 20s at night. The structural insulated panels of the passive solar prefab house ensure that we remain warm. when I don't even bother to keep the cook stove going after dinner. Dylann Roof, 4chan, and the New Online Racism very worth reading for historical perspective, reflecting to today.